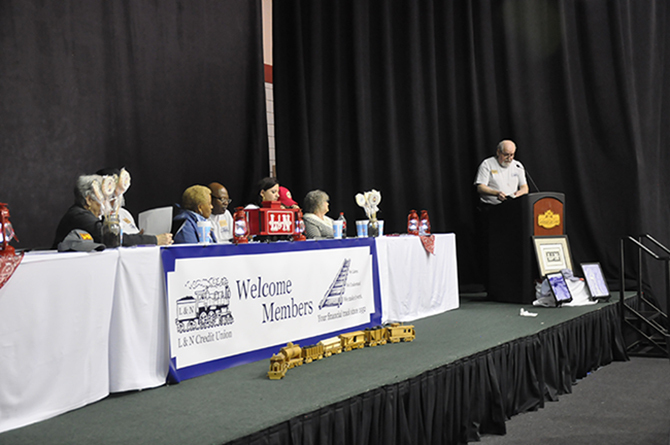 L&N Credit Union's 69th Annual Meeting was a huge success! We had a large turn out despite the bad weather. We enjoyed great food and fellowship. We gave away over $1700 in cash and prizes. Our theme this year was "The L&N" and we had a costume contest with winners dressed in their best railroad attire. We would like to give a BIG 'Thank You' to all who contributed to our L&N Memorabilia Collection including, but not limited to, The Dollar Family, The Sullins Family, The Williamson Family, The Cooper Family and The Fulton Family. Board Chairman, Frank Baker, and Co-Chair, Lynn Williamson, were both re-elected to their positions for another 3 years. If you weren't able to make this year’s meeting, we would love to see you at the next one! Next year's meeting will be L&N Credit Union's 70th! The theme is "The 70's/Disco" and it will be held at the Gardendale Civic Center on Saturday, February 22, 2020. Mark your calendars now!! Online Bill Pay. Safe, secure and easy to use. Call the Credit Union for details. We are actively working to build our social media presence. Please like us on FaceBook @LNCUBHAM and follow us on Twitter @LNCU_BHAM. Christmas Club 2019. Start saving for NEXT Christmas, TODAY! Open a Christmas Club with only $5 and begin to take the anxiety out of next year. CD Rates are on the rise! Call today for details.